Register now to attend the National Labor-Management Conference held by the Federal Mediation and Conciliation Service (FMCS) August 17-19 in Chicago. The conference will feature the latest insights and expertise on workplace challenges, opportunities and strategies for success in the future. The IAM will be well represented at the conference as IAM Midwest Territory General Vice President Phil Gruber is heading up a panel about the Local 701 Automotive Apprenticeship Program. IAM-NFFE National President Bill Dougan will be featured on a federal sector panel and IAM District 15 General Counsel/Assistant Directing Business Representative James Conigliaro, Jr. will be part of a luncheon program discussing new digital business models. Register by Tuesday, July 19 and receive the early bird rate. Registration ends August 8. The conference will feature more than 240 practitioners, experts and renowned speakers and more than 70 exciting workshops and panels covering bargaining, dispute resolution, and new economy topics. 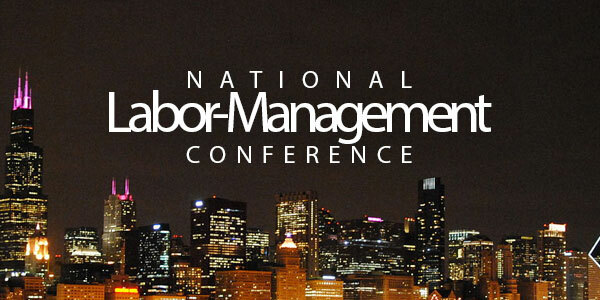 Click here for more info on the FMCS National Labor-Management Conference.